Sunday, 4 Feb: Up early with a mission to start compiling the video clips from the Atlantic crossing into one video, to post on You Tube. The plan was to get it done by midday then head out to the beach, but the task of video editing ended up taking ALL day! As we edit, it feels like 3D cinema, watching CB rolling on the PC screen while we are actually rolling live in the anchorage. In-between advice on clips, Oana is sunbathing on the aft deck, getting her white bits pink. 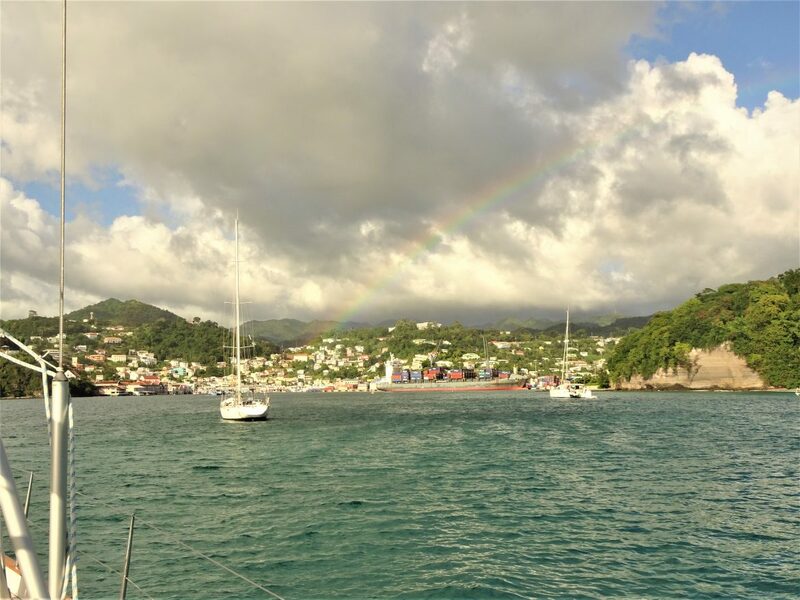 And in the early evening a shower (first rain since we arrived in Grenada) treated us to an amazing double rainbow over St. George town. So it’s back to the boat, where we scan the options of wi-if we can get through our booster antenna. We do find a WiFi and pay for a 24h package and let uploading begin again. But by bedtime its still only a couple of % done. Looks like we will have to rethink how on earth we upload big files, going forward.